Software converted to windows often looks better but performs worse. Tim Macer finds one package that loses little in transition. There is a strong implication, from those creating software today, that high-volume cross-tab reports are old hat, and that researchers and clients are luddites by continuing to demand them. Yet technology that is not up to the task deserves to be resisted. So three cheers must go to VOXCO which has just brought out a true Windows version its StatXP tab package that is both easy to use, yet still designed for serious tabulation. 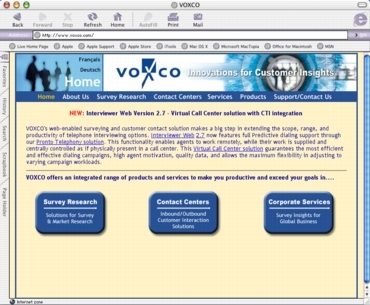 While VOXCOs CATI and web and other interviewing tools made the transition to Windows long ago, StatXP version 4.2 has only just made the leap. The software has always balanced comprehensive functionality with no need to learn a special tabulation language. The new Windows version makes this more apparent. A StatXP table usually consists of a dependent variable in the rows and one or more independent variables in the columns. There is a very nifty dialogue for selecting and reorganising the answers to questions for tabulation: collapsing, merging and linking categories, creating nets or subtotals, re-ordering the answers and combining them with answers from other questions. While you carry out the tasks simply by dragging and dropping, the system display the underlying syntax you are using, which makes it clear to see if you are making the right connections. You also get useful feedback even before running the table, of the number of respondents you have selected: if you selected an and combination, when you meant or you will immediately see the figures take a sharp decline. Just a few mouse clicks can generate a whole series of individual definitions that, if typing it in yourself, could take 10 or 15 minutes to complete. In use, it should be very productive. The rows are organised into a banner, which can also come from complex combinations of questions through a set-up wizard, though there are fewer options than for the dependent variable in the rows. New is a feature called Rich Banners. This gives multi-level headers, sensible boxing and the ability to special case particular columns. reporting and proportional testing to be found in, say, SPSS than most tab package - yet unlike true stats packages, single and multi-coded data can be used interchangeably. It does not, however, contain any true multivariate statistics. A major innovation is three high-quality output formats: Word files, Excel workbooks and HTML pages. Table headings, texts and cells are organised into style groups, and these follow through into Word as Word styles, which means a Word style file can be applied to create a consistent house style. It is easy to develop these as you go, and also to override the defaults. However, Word is notoriously bad at handling very large files, and RTF can be both slow and profligate in disk space. An OLE link is used to export to Excel, which can also be slow - but the wait is worth it. The tables all appear as separate tabbed worksheets, again with cascading styles attached to them to make systematic changes easy, and allow you to template your house style. Output to HTML is fast, and gives you one additional presentation option: to change the colour of alternate rows in the table (it took me back to the days of green striped listing paper). Again, styles are supported through HTML cascading style templates, though creating or even modifying these is a job for an HTML programmer. Unfortunately, it appears as one huge scrolling window, not separate hyperlinked files, and there is no on-screen navigation once you scroll away from the top. Published in Research, the magazine of the Market Research Society, January 2003, Issue 440.